Everybody loves a bull barrel! Bringing the heavy, match-grade barrel from our Officer-size ECO to a bit bigger platform, the Enhanced Commander Pistol is a 4” gun that conceals well but is a tack-driver at the range. With a compact, stainless steel slide and a forged aluminum frame, weight is kept to a svelte 29 oz. 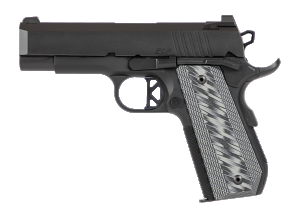 Our new tapered G10 grips and a bobbed mainspring housing enhance its ergonomics, affording shooters with smaller hands an easier reach to the trigger. A tri-topped slide wears aggressive side serrations and a top rib to knock down glare, while our new U-notch rear sight is matched to our brass-beaded front sight. The bull barrel itself is flush-cut to make for easier disassembly and has a 30 degree crown. 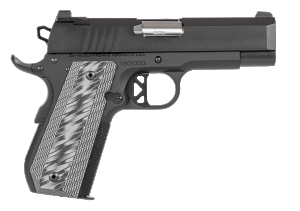 With a similar recoil system to the ECO, it has a flat wire recoil spring that is rated for 15,000 rounds – three times the round count of a typical 1911 dual recoil spring setup. With a compact size that melts away when concealed and a beefy bull barrel, the ECP is an ideal 1911 for everyday carry.